Today’s consumers, especially Millennials, expect variety. Variety=more and more SKUs as food manufacturers add new packaging types, flavors, sizes and other options. Because of the desire for fresh food products in increasing variety and need for convenience, food producers and manufacturers are altering what they are producing, where it is being produced and how it is distributed and transported to the door of consumers. More fresh and chilled products are being ordered in smaller quantities from a wider range of product choices. This is causing a proliferation of new product development, product and packaging changes and updates. Consumer buying preferences have changed markedly. Today’s consumer prefers freshly prepared, locally sourced food products. This is altering the way many shippers do business. Setting up regional supply chain networks, accessing regional transportation routes and temperature-controlled logistics and warehouses is vital and transformative. For some 3PLs, however, the complexity of billing for value-added services for many different customers, inventory types, activities and metrics means that they are missing out on revenue. This typically occurs for 3PL cold storage operators that are not using WMS software with 3PL billing capabilities, using legacy systems or using systems not specifically developed to meet the needs of third party logistics providers. Just as with other issues in warehouse operations and inventory management, having the necessary tools can make a major impact on profitability. According to the Global Cold Chain Alliance (GCCA), the average occupancy rate of a cold storage warehouse currently exceeds 85%. Most industry experts consider that to be a “full” facility. 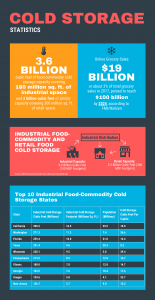 Currently, there is 3.6 billion cubic feet of food-commodity cold storage capacity within 180 million square feet of industrial space, primarily in refrigerated warehouses as well as approximately 300 million square feet of space in grocery stores and other types of retail venues. The growth of online grocery sales has the potential to increase the demand for approximately 35 million square feet of U.S. based cold storage space, moving from retail stores to warehouses and distribution over the span of the next seven years.